With the busyness of the holiday season and the addition of everything else that went on for my family this holiday season, I've been in the mood for quick craft ideas. 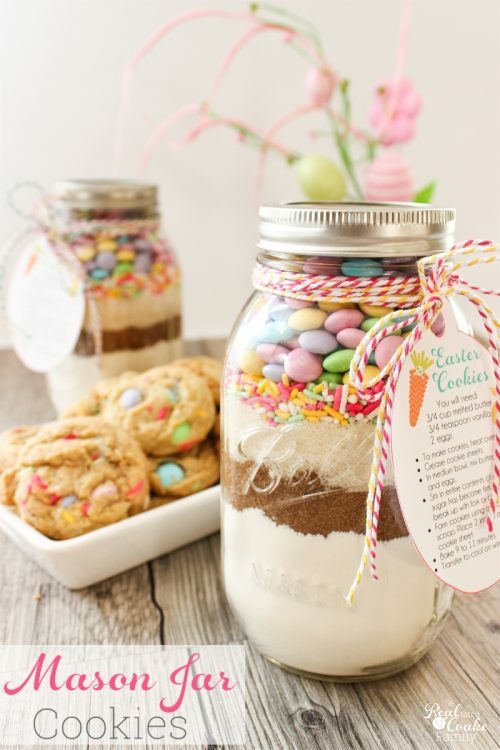 I've got another 10 minute (or so) craft idea for you today. Yes….it involves glitter. Are you really surprised by that?! Lol! I totally have a glitter addiction. 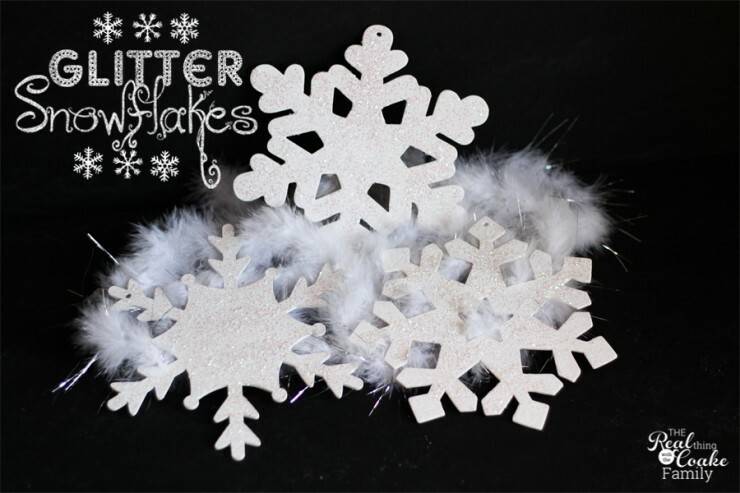 I made these beautiful snowflakes in just a few minutes. They made a pretty addition to my winter mantle along with the glitter clothespins I showed you last week. I'll have the full winter mantel for you to see later this week. 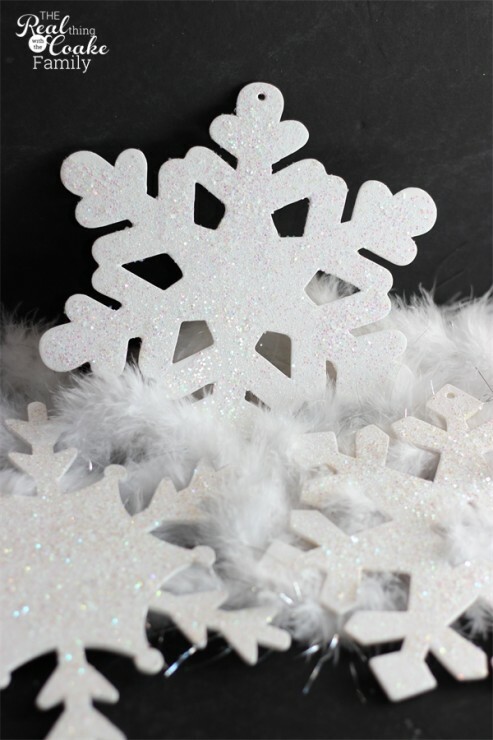 For now, let me show you how easy these snowflakes are to make. As I said, this was a quick and simple craft. Two of my snowflakes were unfinished, one was already finished with white paint. 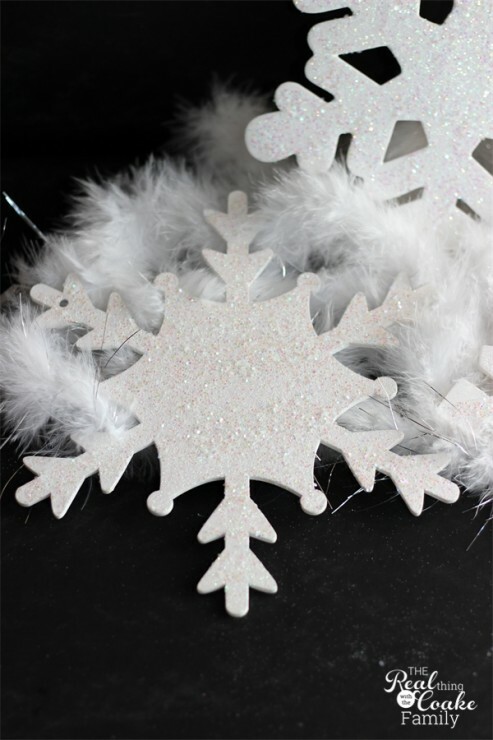 If your snowflakes are unfinished, start with two coats of white paint. My snowflakes are large. Because of their size, the paint was drying before I was finished with one coat of paint. It made it easy to paint two coats back to back, but it made getting the glitter to stick a bit more challenging. After coating the snowflakes with two coats of paint, I made sure the paint was fully dry, then I added a layer of Mod Podge. Mod Podge has a longer drying time than the paint. I was able to paint the full surface of my large snowflake with the Mod Podge and it was still wet so I could add the glitter. 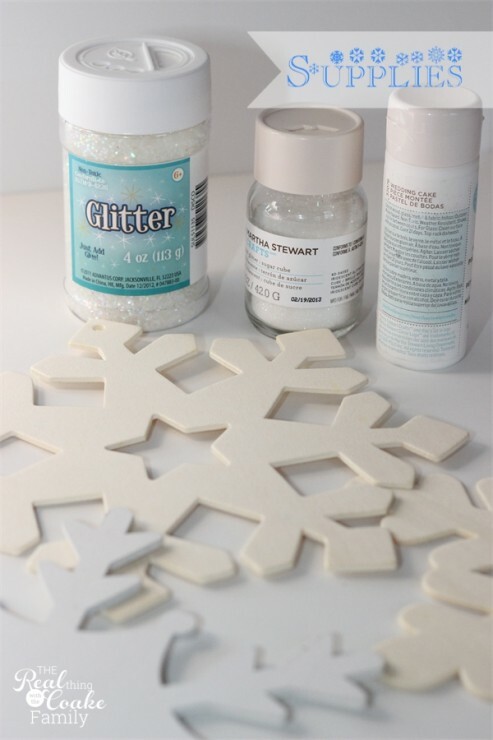 If you are working with smaller snowflakes, you will most likely be able to add the glitter directly to the paint on your last coat rather than needing to use the Mod Podge. I prefer to use two different sizes of glitter. I usually use a larger glitter and a fine glitter. 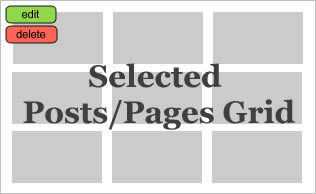 I like the variety of the sizes and texture. You don't have to use two different sizes of glitter. Wait for your Mod Podge and glitter to dry. You can add layers of Mod Podge on top of the glitter to seal it…I don't ever do that step. I'm a bit too impatient and I also have never really had a major issue with all the glitter coming off. As I told you, I used my glitter snowflakes in my winter mantel. I've always wanted to have a winter mantel. This is my first year to actually do it. I love it! I used the wine bottle craft I made last year along with the hurricane lamps I made over late last year. Tune in later this week to see it all…I'm excited to show you and see what you think! There you go. 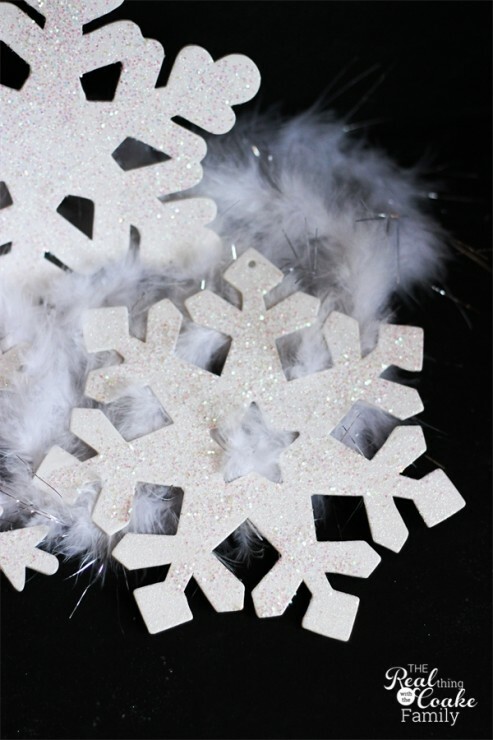 Another quick, easy, and pretty winter craft. Do you do any type of winter decorating? I'd love to hear what you do. Leave me a comment below. 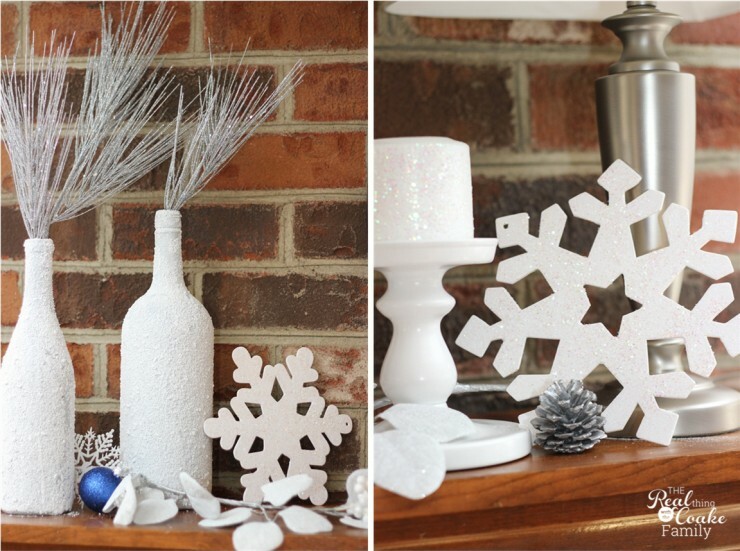 I love snowflakes for winter decor! Marie – Me, too! They are so fun for winter decor. What do you do for your winter decor? Love how you kept winter looking so pretty, great job. Usually things get kinda dull for while after holidays but you’re keeping your decorations so sparkly, bottles and snowflakes are gorgeous. Glad I’m not only one to use winter as a decorating occasion. holidays when all the lights and colors are put away. Still nice to have something pretty to look at. Just couldn’t make myself put my cute little ceramic and fabric snowmen away or all the snowflakes. Love the cute little snowmen smiles and the different sizes. I have a long basket, guess it would be used for bread but I used it for my snowmen, pine cones and mini trees in ball jars, makes a cute wintery display and some more white painted pine cones with couple of big pine cones. I have it on my shutter shelf/a.k.a. mantel with an old window behind it with cedar/pine garlands around top and edges. Hubs asked me why I was keeping those up, holidays are over,- but winter’s not over dear I replied. Pretty! Love winter-y items you can keep up after Christmas. Yes, wintry decorations after Christmas are perfect to me, Sarah! Thanks for stopping by.